The impressive building of the Stara Lubovna Castle was constructed at the beginning of the 14th century as a part of the fortification system. The first written record dates back to 1311. Primarily a property of Polish monarchs, the Drughet family owned the castle until 1343. Notable Hungarian and Polish monarchs such as Maria Theresa of Austria or Sigismund of Luxembourg visited the castle. Even today their portraits decorate the castle walls. In the 15th century, Sigismund the King of Hungary borrowed money from Poland and put the thirteen towns of Spis and the Stara Lubovna Castle in pawn. Later he visited the castle and together with Vladislaus II signed the peace agreement. For the long time the castle was administered by Polish mayors. In the 16th century it became the property of a Polish noble family Lubomirski. It was destroyed by fire in the middle of the 16th century but reconstructed and enlarged in the 17th century. The reconstruction gave the castle its today’s appearance. Renaissance palace, a Baroque chapel and a palace were also built after the fire. In 1768 Móric Beňovský, a noble and a well-known traveller who became the King of Madagascar was imprisoned in the castle jail. The Zamoyski family was the castle’s last owner and since 1945 the Stara Lubovna Castle has been the state property. 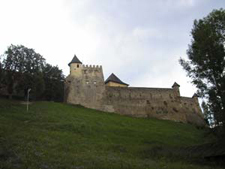 Access to the Castle: We highly recommend visiting the castle located north of Stara Lubovna. Located on a hill, the castle is clearly visible from a long distance. Just follow the signs. Parking is available about 500 m (0.3 mi) from the castle near Stará Ľubovňa Open-Air Folk Museum. Another parking lot is situated next to the Middle Ages area. The castle is accessible by road; you just have to take an easy walk. You can tour the castle individually or with a guide. Guided tours are offered every half an hour and last about 75minutes. The tour starts at the main gate. If you decide to see the castle on your own, a map with the numerical legend will help you to navigate throughout the castle easily. In the first building you will learn about the castle history. The pictures capturing the images of the castle from different historic periods are especially worth seeing. When you pass along a large courtyard, you will reach the other parts of the castle. One of the castle’s attractions is an accessible underground corridor. An impressive tower offers panoramic view of the area below the castle. From there you can see the Tri koruny Mountain (Three Crowns Mountain) in Pieniny and if you are lucky and the weather is nice, you can even admire the High Tatras. However, if you want to enjoy the panoramic view, you will have to climb one hundred steep and narrow steps leading up to the tower. 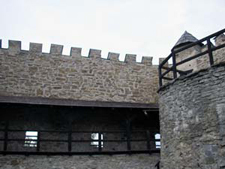 The tower, which used to serve as a prison, can be found in the oldest part of the castle. To reach the tower, you will have to pass through a large gate. Castle dungeon is accessible to public as well. You can admire the castle surroundings even from the courtyards. The castle houses several exhibitions: historic carriages and bicycles, old handicraft tools, castle’s historic furniture, the picture gallery with paintings of the castle’s proprietors, and the exhibition of clothing from various historic periods (this exhibition is changed often to focus on a specific historic era). Before the end of your visit you will tour St. Michael’s Chapel originally from the 17th century. Finally, you will conclude the tour by visiting the castle’s well and the last rooms furnished by the castle’s last owners – the Zamoyski family.